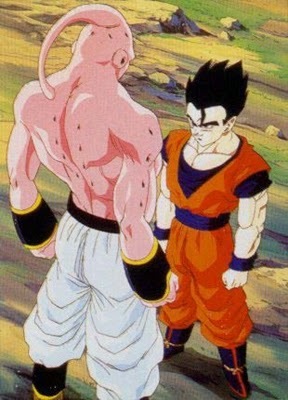 I was wondering how was Gohan so much stronger as a normal Saiyan than Goku was as SS3 when he fought Buu. Is there not like a power level to reach the next SSJ form? Why couldn't Gohan reach SS3 already? Or he could fight as SS2 at least? If Gohan with the Mystic Sword is as strong as Goku was as SS3, there wouldn't be any difference in their strength when he would transform into SS3? Saiyan Power Levels - check this link out. It states the power level every character have during a specific battle. I found this in the DB Wiki . As Goku, Supreme Kai, and Kibito observe what is happening down on Earth, Gohan grows increasingly impatient as Old Kai reads and laughs at comics instead of unlocking his power. Gohan soon loses his patience and angrily powers up, displaying an amazing power that illuminates the Supreme Kai planet. However, amazed at realizing that some of his power really was unlocked, Gohan apologizes to Old Kai, and resumes the ritual. After some time, the ritual is finally completed and Gohan is told to power up like he does for the Super Saiyan transformation; however, when he does, his appearance does not change, but his power and strength gain an awesome increase. Gohan says goodbye to Supreme Kai, Old Kai, and his father Goku and is transported back to Earth by Kibito. Before Kibito transports back to the Supreme Kai planet, Gohan asks for the clothes reminiscent of his father's, to which Kibito happily complies. Kibito wishes Gohan good luck and transports back to the Supreme Kai planet. With his power finally released and the fate of the world now in his hands, Gohan flies off to confront the new Majin Buu: Super Buu. So it seems when Gohan get "Mystic Gohan", even though he increased his Power his appearance didn't change. So he coulnd't transform in any other Saiyan form than the normal form, but still getting stronger. The first Super Saiyan transformation occurs when a Saiyan who has reached a very high level of power loses himself in a fit of rage. However, the transformation must be triggered in response to a great need, an example being in Goku's case to defeat Frieza. While physical change is not too drastic apart from a slight increase in muscle mass, the power output increase is colossal; the form is said to multiply the Saiyan's power by 50x times its normal amount (in the Dragon Ball Z: The Anime Adventure Game, the multiplier for the form is 2.5x the user's normal amount of power). When Goku utilises the Super Saiyan form against General Rilldo in Dragon Ball GT, Rilldo states that Goku's power has increased a hundredfold.